Slow cooker sausage corn stew recipe. 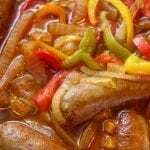 Sausages with corn and vegetables cooked in a slow cooker. Very delicious! Use any kind of sausages you like-vegetarian sausage links are delicious too. Serve this delicious stew over cooked rice or cornbread to soak up juices. 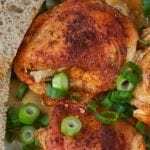 This recipe belongs to Creole cuisine. Instructions: Peel and chop 1 large yellow onion. Slice, core, and chop 1 large red bell pepper. Peel and mince 2 garlic cloves. In a large bowl, soak red and green beans for a couple of hours, then drain and set aside. In a 6-quart (6 L) slow cooker, combine all ingredients, except salt, black pepper, and hot pepper sauce. Cover the pot and cook on high-heat setting for 4-5 hours or until sausages and vegetables are cooked through. 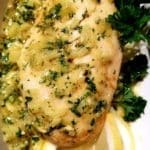 Turn off the slow cooker and open the lid. Season sausage corn stew with salt and black pepper, to taste. Stir well before serving. Transfer to serving plates. Serve over cooked rice with hot pepper sauce. Enjoy! In 6-quart slow cooker, combine all ingredients, except seasoning and hot pepper sauce. Mix well. Cover the cooker and cook on high-heat setting for 4-5 hours. Turn off the slow cooker. Season the stew with salt and black pepper and stir well. Serve over cooked rice with hot pepper sauce.